1 - shirt/s $9.95 ea. 3 - shirt/s $9.30 ea. 5 - shirt/s $7.90 ea. Athletic Undershirt Comfort at its best - Tay Athletic undershirt - best features of a fine tee shirt, crossed them with the best features of an athletic shirt in 100% super soft ring-spun Cotton. Quality made in the USA. 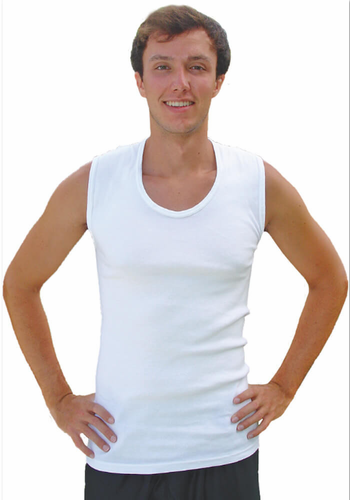 Tay Athletic Undershirt - best features of a fine tee shirt, crossed them with the best features of an athletic shirt in 100% super soft ring-spun Cotton. Armhole openings small enough to help absorb perspiration, yet large enough for comfort. In colder weather, the Tay Athletic Undershirt makes a superb "under-vest" adding a comfortable layer of warmth. Generous length with a special scooped neck for best appearance. Quality made in USA. Color: White. Out of stock in size Large: 42-44 and next shipment will be sometime Fall, 2016.